A Minecraft player's latest creation will bring back fond memories for fans of the SNES. If you were stuck on a deserted island with a Super Nintendo and only a single game to play until rescue, you should hope that the game is The Legend of Zelda: A Link to the Past. 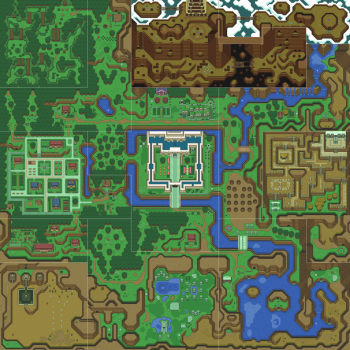 Easily one of the best Zelda games in the franchise's history, the game had a giant overworld map that held tons of secrets and nooks to explore. This map has been recreated by a nostalgic Minecraft player with an impressive level of accuracy. YouTube's DoubleOBond took 108 hours and 59 minutes to create the map, which is 512 x 512 x 104 in Minecraft blocks. To the best of his ability, DoubleOBond included every bush, trail, and rock. The world is still lacking in Octoroks and Moblins, but to add them would be a much bigger job. It looks pretty good to me. If there's one thing I'm glad was left out, it's those accursed falling boulders. DoubleOBond plans to adjust the map as Minecraft creator Markus Persson adds new features into the game, and even hopes to link to dungeons and interiors when teleporting is patched in. He also wants to create Link to the Past's dark world, an unfriendly version of the light world seen here. There must be a way to add pots to smash too, because it's not Zelda without those.